A disk drive could transform your Spectrum system, says SIMON N GOODWIN in the first ever review of Sixword’s Amstrad-beating Swift Disc — cheaper and more flexible than the +3, he says. THE SWIFT DISC system was developed last year for a large company which eventually lost interest in the Spectrum. The inventors — ‘big computer’ designers — decided to press on and sell it themselves. The system began as an easy-to-use combination of a standard disk interface and a press-button copier like a Multiface. It’s since grown in power, but the original core remains. The interface is a black box with connectors for a Kempston joystick, serial printer and up to four standard disk drives. You use your Spectrum or 128 as normal, with the interface connected. The fun starts when you press the button at the back. Whatever program you were running is suspended, and the disk system says hello. You can then use any of the SWIFT DOS commands. For instance, SAVE 0;FRED 7 will save the entire contents of memory on disk zero under the name FRED. The data is not compressed as it is in a Multiface file, but you can still get 13 48K images, or four 128K ones on a disk. The ‘7’ in that command is the screen border colour to be set when the program is reloaded. If you type an ‘S’ after the filename, only the screen is saved. 128 users can choose between its two possible screens. You can save the contents of any memory area similarly. LOAD fetches programs, screens or code from disk. QUIT lets you restart the loaded program, with its display intact. * resets the computer; ERASE deletes disk files, unless you’ve used KEEP to protect them against accidental erasure. You only need to type the first character of a DOS command. If you miss out parameters — for example, if you just type L — the system will ask you questions to obtain any other information it needs. ALTER lets you edit program memory, so you can use all the POKES published in CRASH PLAYING TIPS without resorting to loading tricks or a Multiface.. FORMAT makes a new disk ready for use. It takes about two minutes to set up a 640K disk. When you format a disk you must specify the maximum number of files it can hold — the default is 32. Larger numbers slow things down and gobble up some file space. CATALOGUE comes in two variations: the BRIEF form tells you the name of each disk file, the date it was created, the size in 256-character sectors, and the file type. The FULL listing also tells you the code address, start or record size of each tile. MOVE and BACKUP transfer files, or entire disk contents including empty spaces, between disks. This is a slow process, involving much disk-swapping if you’ve only got one drive: data is copied in 4K chunks to avoid disturbing the computer’s main memory. It’s often quicker to copy files by loading and saving them individually. Version 1 was ace for gamesters, but of limited use to programmers and other serious users. Version 2 added commands available from BASIC to the DOS commands called up by the magic button. The disk BASIC syntax is rather erratically recorded in both the manuals I received, but it’s easy enough to work out with a little experimentation. Most disk commands are distinguished by a per cent sign before the disk or channel number. This is simpler than the microdrives *"m";1; though OPEN and CLOSE look odd with extra percent and hash signs after the automatic hash that comes with the keyword. You can LOAD, SAVE and MERGE programs, screens, code and arrays, just as with cassette but much faster. LOAD reads about 7K every second. If you LOAD a memory file created by SWIFT DOS it runs automatically. Unlike Amstrad’s +3 the Swift Disc can OPEN files. You can use up to four files at once, though they must all be on the same drive. They can be normal text files, processed with PRINT, INPUT and INKEY$, or random-access files with fixed-length records, passed back and forth with IN and OUT keywords. The BASIC interpreter can only process files at about 0.5K per second. A file can be opened at the start or the end but you can’t rewind or move about in a text file, and there’s no way to discard data from the end without creating a new file. The %EOF function lets you detect the end of a file, but you can’t trap other errors without a toolkit. You may run into problems if you CLEAR low addresses when using Swift BASIC. There’s no check on the amount of free memory when you type in a program line, so you may get stuck editing a line if the system can’t find enough room to convert it into tokens. Swift includes a FORMAT command for its printer port, which lets you LPRINT and LLIST at any speed to any width of serial printer. MICRODRIVE EMULATION — A REASON TO BUY? Serious users will be especially impressed by the microdrive emulator, a new feature of version 3. This lets you run commercial microdrive programs on disk without changes. 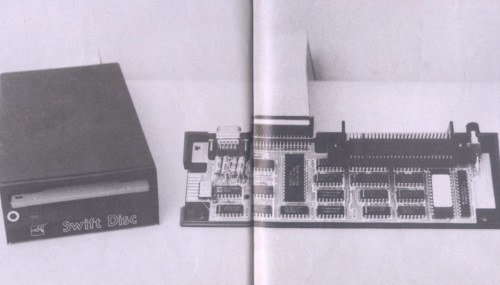 You don’t need Interface 1 or real microdrives, though an Interface 1 manual is useful if you want to develop new microdrive programs — Swift doesn’t document the Sinclair drive commands. The microdrive emulator is easy to use. It takes about four seconds to load a file called EMUL, which stores a close imitation of Sinclair’s microdrive system in the disk-interface RAM. Swift DOS and Swift BASIC are disabled and replaced by microdrive commands just like those provided by Interface 1. The main difference — apart from a massive increase in reliability — is that FORMAT grabs an area of disk space and uses it to imitate a microdrive, rather than set up a real cartridge. The disk area appears as one 128K file from Swift DOS, but when the emulator is loaded CAT shows you up to 50 fiIes ‘inside’ that area. Four pseudocartridges fit on one disk, and you can use them all at once. The competing Disciple disk system makes a brave attempt at microdrive emulation by recognising microdrive BASIC syntax and the hook codes, microdrive system calls provided by Sinclair. Unfortunately ‘real’ machine-code programs like Tasword 3 tend to leap directly into interface routines. Only the Swift Disc can cope with this, by mimicking the Interface 1 code right up to the point at which data is about to be read or written. I tried out a prerelease version of EMUL with all the microdrive programs I could muster, and it worked remarkably well. I had no trouble creating disk versions of the programs by loading the emulator and following the microdrive-transfer instructions. All the programs loaded and saved disk data files without trouble. Besides Tasword I tried Cheetah’s Sound Sampler, Powerprint 2, Beta BASIC, HiSoft Pascal 1.6M, Oasis’s Laser Genius, MIRA Pascal (a new compiler, reviewed here next month), Discovery/Gremlin’s Code Machine 3.1 and its parent, Picturesque’s EDITAS 2.1. CAT options, multifile assembly and other tricky operations worked fine. The only things that went wrong were file ERASE operations from Tasword and Sound Sampler. Both programs ignored the command. Swift says that a misplaced instruction in the emulator has since been moved, and that ERASE now works even if the microdrive ROM is called directly. The microdrive emulator is a powerful incentive to buy a Swift disk, if you already use microdrive software — or would like to but can’t stand the cartridges. At the moment EMUL runs at about the same speed as a real microdrive, though CAT and ERASE are noticeably faster. Swift is still fine-tuning the code, and plans to double the speed of many file operations by interleaving data inside the pseudocartridge. All commands can be abbreviated to their first letter. The Swift Disc interface uses the same black plastic box as Sinclair’s Interface 1 with the words ‘Sinclair’ and ‘ZX Interface 1’ filed off and replaced by plastic stickers. The interface fits the original Sinclair Spectrum models well, but it’s a very tight fit on the Amstrad +2. A Kempston joystick socket skulks at the back of the box, where the Interface 1 serial plug used to fit. Some of the original holes in the case have been cut out to make room for different connectors. The disk-drive socket sticks out where Interface 1’s network sockets used to live. The disk connector is the same as that used by the BBC Micro and QL, among other machines, so there’s no shortage of alternative drives. You can plug in up to four modern 3.5-inch or 5.25-inch drives; the software automatically adjusts to different drive formats. Some old drives can’t switch tracks fast enough; Swift only allow drives 0.006 seconds to step from one track to the next. The Disciple interface copes with slower drives, but you must load a configuration file whenever you start to use it. The Disciple also limits you to two drives. Alongside the Swift Disc connector is an edge connector for other Spectrum peripherals. You can plug in anything that doesn’t use a magic button to interrupt the computer, and Swift hopes to remove even this restriction. After all this standardisation the printer port comes almost as a relief to Spectrum fans used to the way Sinclair defied convention. The port uses the ultimate obscure socket — a modified Microdrive edge connector! Swift didn’t send an adapter (£14.95), despite requests, so I can’t say how well it works. The company says it’s much like the port on the Interface 1 — in other words, OK for driving an RS-232 printer, but tough going for anything else. ZX and Alphacom printers still work. You can plug a genuine Sinclair Interface I into the back of the Swift unit and run microdrives and disks at the same time. You can’t use real microdrives while you’re using the microdrive emulator, for obvious reasons, but Swift supplies a program to move the contents of a tape into a pseudomicrodrive automatically. Items in brackets are optional, "/" separates alternatives. The Swift contains 8K RAM and 16K ROM. The ROM is split into 4K sections, with space for up to 32K. The entire system, including the disk and printer ports, is hidden under the Spectrum’s 16K ROM unless the DOS is in use. This makes it hard for protected software to detect and disable the interface; I have yet to find a program that won’t SAVE to disk properly. The circuit board is crammed into the Interface 1 box with no room to spare. It’s well-engineered but crying out for some more space. Swift intends to use its own box eventually, saving space and money by redesigning the logic circuit to use custom ULA chips. The Swift Disc is very competitively priced, probably because it’s only available direct from the manufacturers — there are no retailers to pay. The interface costs £76 on its own, and £149 with a separate 640K 3.5-inch drive and power supply. That’s a bargain price for the drive — you’d be hard put to find another similar unit for under £100. The Swift system competes with the Disciple interface, which Franco Frey reviewed in CRASH Issue 38. The Disciple costs £90 without a drive. Both systems load at similar speeds, but the Swift SAVE is about twice as fast as the Disciple’s. The Disciple has the edge in terms of hardware — it packs 780K, rather than 640K, into a disk (but some of that space is needed for its configuration file). It has Sinclair standard joystick and network ports, and a flexible driver for parallel printers. But the Swift is easier to use, and significantly more compatible with existing programs. Amstrad evidently thinks a Spectrum with a disk drive is worth £250, or at least £200 — our predicted price for the +3 this Christmas. But the +3 has less than a third of the speed and capacity of the Swift and Disciple. It won’t work with microdrive software, and lacks BASIC file-handling commands. Most damning of all, there’s no easy way to transfer protected game tapes onto +3 disks. Spectrum-specific software may be published in that format, but I’d be amazed to see hit games released on three-inch disks alone, without tape versions. The +3 benefits from serial and parallel output ports, and comes all in one box. In theory it’s compatible with the old CP/M business operating system, but 80-column display hardware will be needed for most programs to work. Frankly, I don’t think Spectrum users need or want CP/M. The Swift Disc is well-engineered and competitively priced. It’s fast, friendly, and uniquely compatible with existing Spectrum software. The question is: can Spectrum users afford a £150 upgrade? It’s worth it, but only if the restrictions of cassette are hampering your use of the computer. You DO get value for money, though — a disk drive totally transforms your system.